You all surprised us, as you so often do, by coming up with several different (completely valid!) interpretations of what constitutes a different yarn base – I can’t tell you how often we tweet a new question and an hour later see someone posting on Ravelry with an extremely well thought out but far trickier answer than we were imagining! Considering that we started out with just about 20 yarn bases, 134 sounds like a lot, but, honestly, it doesn’t sound like such a huge increase over 7 years, right? But when you break it down by colors, we have more than 9,000 different combinations of colors and bases currently being sold in the shop, a truly mind-boggling number. We’ve already filled up the entire front portion of the “huge” retail space we moved to in 2012, and there’s more in the warehouse. Everyone who submitted the correct answer has been credited and e-mailed to confirm. If you believe you submitted the correct answer and did not receive an e-mail, please let us know so we can take care of you. Look for a new trivia question for this week on Twitter! P.S. If you’re interested, the four yarn bases that are dyed as multiple bases are: Juniper Moon Farm Findley and Findley Dappled, Blue Sky Alpacas Organic Cotton and Multi-Cotton, Manos del Uruguay Wool Clasica Solids and Multis, Kauni Effektgarn 8/2 and Solids. I don’t normally do extended blog posts about my personal knitting projects, but we get so many questions about this yarn so I thought I would show you! 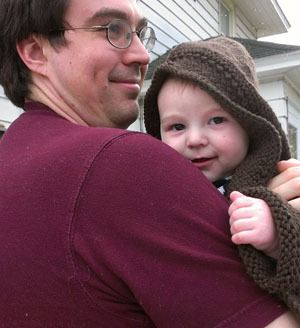 Last fall, I knit a Latte Baby Coat for little Levi. It was too big, in the way that baby sweaters should be lest they only fit for a single week, and it kind of made him look like a little Jedi. And thus the nickname “Jedi Robe” was born. After a winter of snowy walks in the woods, Dan expressed some jealousy for Levi’s sweater, which was big and thick and warm (and which he outgrew in March, perfect timing), so I resolved to knit them both one for this coming winter. We chose Emilien as a starting point for Dan’s sweater as I doubt the basketweave buttonband would fly, and of course it could only be in a single color, “a man color,” and after much perusing and sampling and surveying, he chose my original pick, Blue Moon Fiber Arts Targhee Worsted in Pining 4 Ewe. Targhee Worsted is everything I love in a yarn. In a word, I’d say it’s wooly. Just how I like it! It’s a nice sturdy worsted weight that will knit up to a true worsted gauge happily and could even take an aran gauge if you like your knits a little drapier. 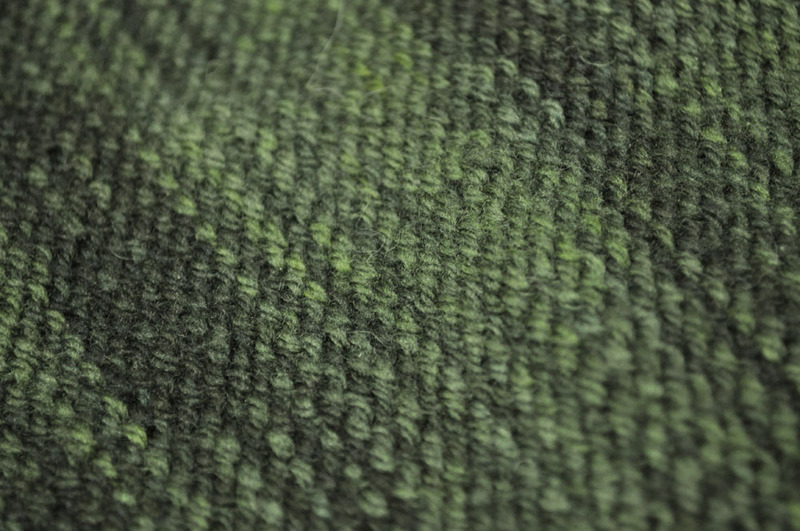 It’s got a lovely stitch definition for cables and ribbing and armhole details. The majority of our hand-dyed wool yarns are milled with superwash merino, which is by its very nature and incredibly fine and short fiber that has been processed repeatedly until all that’s left are the smoothest bits. It’s very, very soft. Targhee Worsted is milled with Targhee fiber, which is similarly fine and soft, but, unlike merino, Targhee has a lot of crimp to it, which makes it much less smooth, and in this case is also not superwash, which means it’s not processed quite so much, which will also make it less smooth. What this means for your final yarn is that it is still quite soft by wool standards, but it’s also still got its crimp, and with longer staple lengths you’ll also find it both looks and feels a little more hairy. You know, wooly. It feels like wool, but, fine wool. It manages to simultaneously have a real wool feel and also be soft, but it won’t feel soft next to your cashmerinos. For me, the real test was if Dan could wear it, as he is someone who’s pretty sensitive to wool and alpaca fibers, so I knit him a little swatch and made him tuck it in the collar of his shirt and wear it around. The verdict? Plenty soft, not itchy at all. And so a sweater was born. Or rather, begun to be born. You can see I’ve still got a little work to do here. This week’s trivia let you flex your math and reasoning skills along with those needles! We asked you to calculate the yardage received from this sample cart. Blue Moon Fiber Arts’s scrumptious Yaksi yarn contains a decadent 250 yards per skein. It’s also on 100% Power Boost this quarter, which means that for every skein you buy, you get credit for buying 500 yards of yarn. Kauni 8/2 Effektgarn comes in a range of weights; the one in our cart here is the 130 gram put-up, which contains 572 yards according to the product description. Then we have 8 skeins of Juniper Moon’s Yearling, a yarn we’re very sad to see being discontinued. Each skein contains 109 yards. At 8 skeins, that gives us 872 yards plus a 50% yardage bonus for having 6+ skeins of the same color/base. Which gives us a grand total of 872 + 436 (50% of 872) or 1,308 yard for Yearling. Last but definitely not least is two skeins of Three Irish Girls Springvale DK, I assume to knit the softest winter scarf of all time. At a 50% Power Boost, each 270 yard skein gives you credit for 405 yards, for a total of 810 yards. 500 + 572 + 1308 + 810 = 3,190 yards, our final answer. And a special thank you to our intrepid programmer, the one who makes sure the shopping cart can handle all of these details when adding up your yardage! It can! Your yarn is beautiful! Why not show it off by making it a part of your home decor instead of jamming it into a dark corner? Let others share in the drooling and thank them when they comment on how gorgeous your TML in Firewood is. If you don’t care what the neighbors think, organize for yourself! Imagine how happy it would make you to come home to a colorful array of the special yarns you picked out! 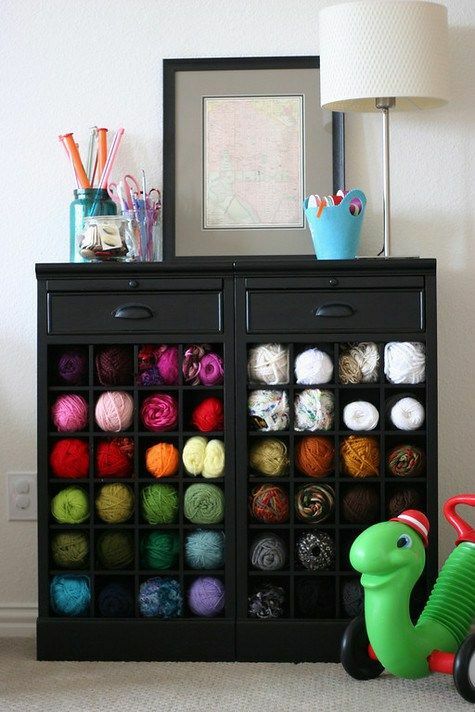 Whether in a closet or a whole room, your stash can look just as stunning as the pictures you see on Pinterest! 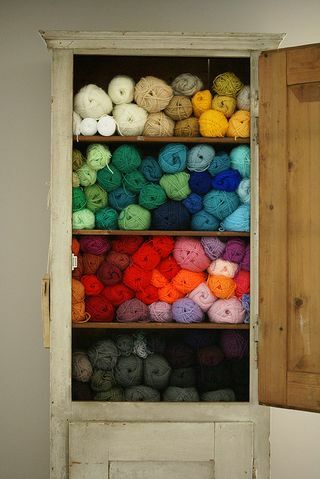 At the very least, organizing lets you pull out your pretty yarn and find that precious skein you forgot you even had! Many of us have very large stashes and it can be easy to forget what you have. If you are a list maker, here is your creme de la creme! Make a list of every skein in your stash in order to better understand what you will need to store them properly. Maybe you prefer spreadsheets or tables, go for it! If you have the time, use the Stash feature on Ravelry. Whichever method is easiest for you, make it happen! This is the first and most important step before choosing a organization method. Now that you know what you have, you can start to think about which organization method will work best. Does your brain think in color, base, project type, dyer, fiber type…? However you buy yarn is probably the best way to organize. Maybe you think about which colors look best on you so you buy a lot of purples – sort by color. You may prefer to have a variety of bases for different projects. Does it make sense to have all your Malabrigo together and Sweet Georgia somewhere else – sort by dyer. Here comes the fun part, picking the piece! Drawers, cubbies, divided cubes, multiple shelves, curio cabinet, luggage…the possibilities are endless when selecting the piece to house your pretties! We suggest re-purposing furniture for a few reasons. Pride. There is something very special about taking old and worn items and making them new again with your own hands! When someone asks, “Wow, where did you get that?” You can beam with pride when you tell them YOU made it! Customize. You can choose to do whatever you’d like when re-purposing furniture. Maybe you want to line shelves with colorful shelf liners, strip and stain an old hutch to match your existing furniture, paint the back of cubbies with an accent color, line a suitcase in pretty fabric, or find vintage hardware for a chest of drawers. The look of your piece is completely up to you! Value. Thrift stores, yard/estate sales, and curbside finds are all perfect places to find inexpensive used furniture. Quality. If you have never bought used furniture, you will definitely be surprised at the quality of items you can find if you just take a little time to hunt. We’ve all seen Antiques Roadshow, right? There’s a gem waiting for you, too! Maybe you have less space or just prefer plastic, try clear plastic bins. These will keep your yarn safe from pet hair, insects, smoke, and moisture that could cause mold. Clear plastic bins can look simple and clean if you follow tip #4. Labels simply make your life easier! You label your folders at work for easy recognition, you label your kids coat for easy return, and you label yourself at parties for easy friendship! If you chose to use plastic bins instead of a piece of furniture, the easiest way to label is simply writing each skein and taping it to the outside. We suggest using a separate label for each skein so when you use it, just pull the label off to avoid messy crossing out. The best way, but most time consuming, is to take pictures and use those as your labels. 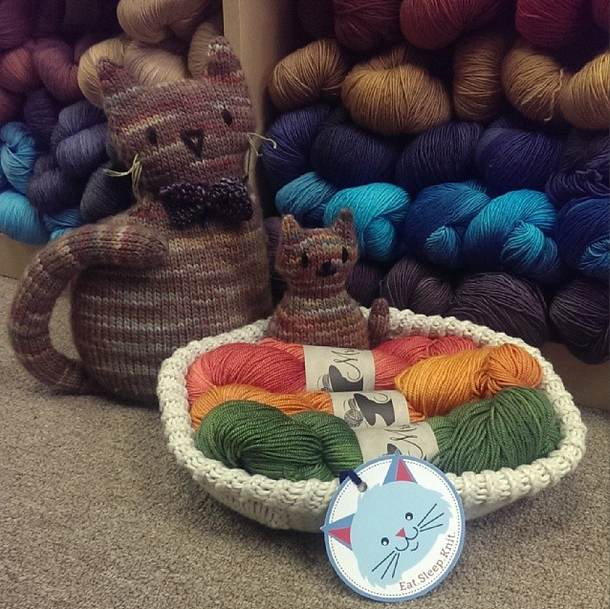 If you choose to take pictures, you can always use the Stash feature on Ravelry. Line these bins neatly on a shelf or stack them tall with the labels facing out, of course! For those who are less crafty, here are some Labels with a little ESK flair! If you are more creative, labels can come in many forms like in the picture below! 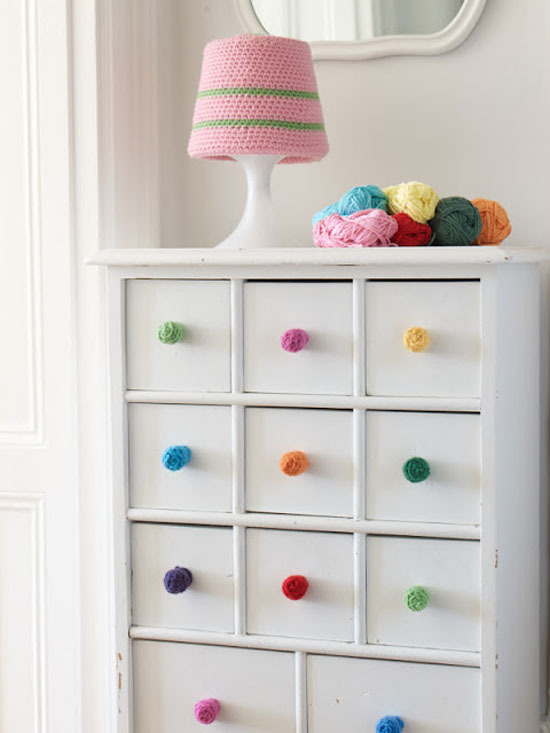 Yep, those are tiny yarn balls as drawer pulls denoting which color is in each drawer! There are tons of uses and one of them does not include sitting in the bottom of a bin never to be thought of again! Once you complete this difficult task of “re-homing,” you can look forward to filling your shelves, drawers, or bins with all of the pretties you have collected over the years. This whole process will make planning for projects so much easier. One quick look at your newly organized stash and you’ll know exactly what you need or don’t need for your next project. No more digging, no more double buying, and definitely no more exhales of jealousy when you see pretty stashes online! Most of you probably are familiar with Madelinetosh‘s Tart, a shade of red that has been called fiery, sultry, stunning, and of course, tarty. The best tarts are. But many of you were surprised to learn that Dream In Color offers a Tart as well, in four of its bases. (Clockwise from upper left: Calm, Everlasting DK, Jilly, and Everlasting Sock) But Dream In Color’s Tart is a vibrant green, like a tart apple or even a bit lime-esque. One of you even suggested, and we agree, that a project with both Tarts would make a delightful addition to Christmas knitting. Maybe you need some special holiday striped socks this year? Everyone who submitted the correct answers (Madelinetosh & Dream In Color) has been credited and e-mailed to confirm. If you did not receive an e-mail but believe you submitted the correct answer, please e-mail us so we can take care of you. Don’t miss this week’s question on our Twitter! Thanks most awfully for your lovely message. I couldn’t be more pleased that you find the yarns to your liking. I’m in Amsterdam sipping coffee while waiting for the fellow with the long hook to fish my bicycle out of the Herengracht, so happily I have a moment to offer you a reply to your questions. 1. Your colorways are simply one-of-a-kind. What inspires you? Inspiration is like a wild bird. It can fly at you from any direction without notice, and is gone in a flash if you don’t catch on the wing. I cannot tell you that “this” or “that” inspires me, because very little does not. 2. What does your design process look like? Do you have a notebook or scraps of paper with ideas? Mostly, I play. That is all. I play. I try to be unmindful of fixed goals or destinations. I play. When something I play with is pleasing, then I make a note of it. That note may be in a notebook, on a napkin, or in the smooth sand at the water’s edge. It depends upon where I am. 3. When you aren’t making these incredible yarns, where would we find you and what are you doing? Wherever whim and passport take me, dear heart. And when I’m not making yarn I’m most likely playing with it in some fashion. 4. What is the first thing you ever knit? A set of matching luggage for my favorite doll. She was envious of mine and wouldn’t shut up about it. 5. Mrs. Crosby Loves to Play is a very new brand but what are your plans for the future? More bases? If one wishes to stand still and repeat oneself, one should seek a field of employment other than mine. I shall be keeping my eyes open for interesting new bases, new colors, and new lines to add to the pretty handmade cards and soaps in my Ephemera lines (http://mrscrosbyplays.com/ephemera.html). 6. Dare I ask, who is Mrs. Crosby? She, madam, is me, madam. Then this quote before her signature sealed the deal in my affinity for this, as she would say, madam: “Life is a series of events darling, dress appropriately.” It was an absolute pleasure briefly delving into the Mrs. Crosby Loves to Play world and we send our utmost appreciation to Mrs. Crosby for giving this interview! 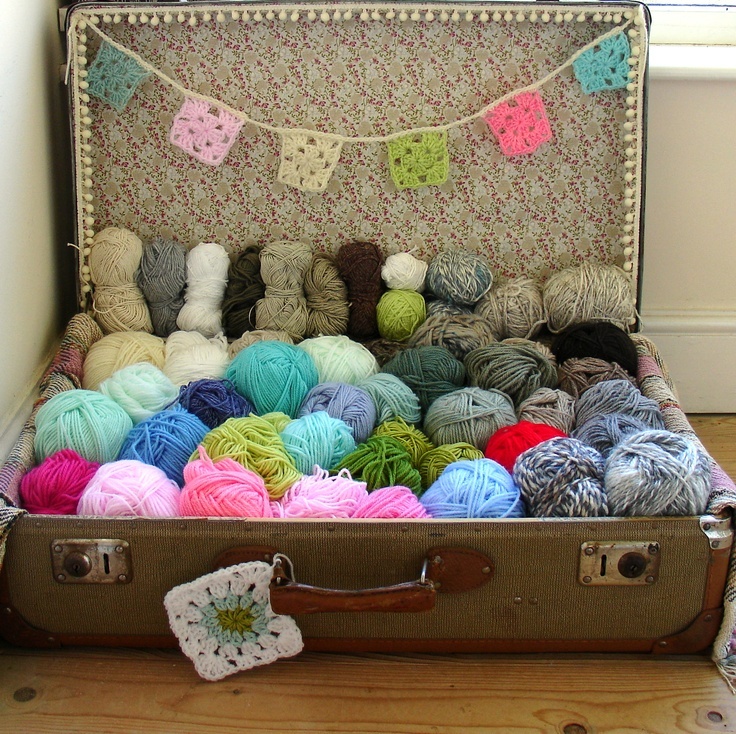 Comment below with your image of Mrs. Crosby or share what you are knitting with Train Case, Satchel, Hat Box, Carpet Bag, or Steamer Trunk! This past week, we asked you to identify how many linen and linen-blend yarns we currently have for sale. The answer was, of course, four! Four lovely linen yarns, each with its own distinct fabulosity. There’s Claudia Handpainted Drama, a traditional wetspun sportweight linen that knits equally well to firm or loose gauges. At the opposite end of the spectrum, Madelinetosh’s Dandelion yarn blends 10% linen with their popular TML base yarn for a more heathered, linen look with the wooly feel everyone loves. It’s no secret that I love linen knits. Our love affair began during the 2008 Ravellenic Games (formerly known as the Ravelympics) when I chose for my project the Versailles Shell, a tank I hoped would be perfect for wearing during hot Georgia summers. The yarn? Claudia Handpainted Drama (formerly known as, simply, Linen). And let me just be honest – I wasn’t all that excited about it. In the hank, the yarn seemed an awful lot like limp twine, and it was hard to see how this wasn’t going to be hard on my hands and awful to wear. Never since have I been so wrong about a yarn, perhaps in part because after this experience, I adopted a firm policy of trying a yarn before judging it in its hank. At a tight gauge, linen can be a little hard on the hands – similar to cotton – but not too, and the finished fabric is the most wonderful, cool, soft thing you could hope to wear. Linen loves abuse; it gets better when you wash it, when you dry it, when you leave it crumpled in a ball in the corner. In short, linen is the perfect thing for my busy summers, and I’ve got a new Versailles on the needles right now as this one now lives at the shop. Handmaiden Flaxen is another favorite, a slubby blend of silk and linen that makes for stunning open and lacework projects like the Kowloon Cardigan. And then there is Shibui Knits Linen, a linen unlike any others – a laceweight, chain-plied linen that is at once soft and breezy and the linen that might just convince you, once and for all, to add a bit more linen to your stash. Everyone who submitted the correct answer (four!) has been credited and e-mailed to confirm. If you did not receive an e-mail and believe you should have, please let us know and we’ll take care of you. Make sure to check our Twitter for this week’s question!